Should you care whether your academic monograph or edited collection has an appealing cover? Does it matter? And can you/should you get involved? My answer to all of the above is yes! I know there are brilliant academic books out there with boring, samey or just random covers, so I’m not saying that outward appearance necessarily equals inward quality or originality. 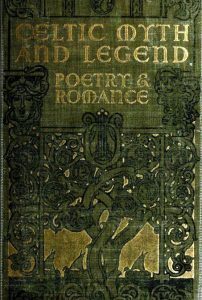 But, at the same time, should academics just be satisfied with covers clearly chosen by publishers without much care for aesthetics or relevance to the topic, perhaps in the belief that only specific libraries/specialists will buy the book, a small but guaranteed readership, unaffected by the cover? In our times of emphasis on public engagement and “impact”, why should you not wish for your book to be appealing to any reader? And if you believe your own research to be exciting, fascinating and worth reading, shouldn’t your book cover express that too? I’m writing these reflections in a rare moment of calm (the term has just ended!) just after Palgrave Macmillan have released the cover of my new monograph on their website. I’m really proud of this cover and I’ve been wanting to share it for a few months now – so this is indeed an exiting time. I was actively involved with the cover design of both of my monographs, and this seems like a good time to reflect on my engagement with this task – and the results! 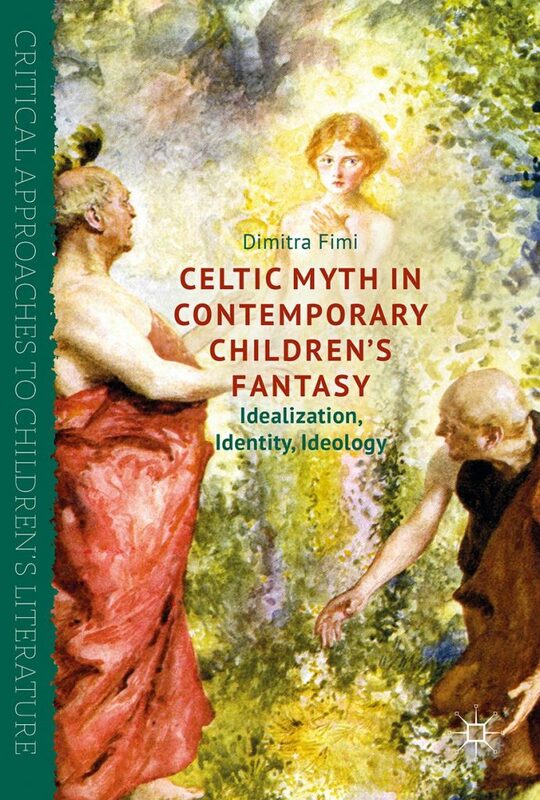 My new book focuses on the creative uses of ‘Celtic’ myth (Irish and Welsh) in contemporary fantasy literature written for children or young adults. It explores the work of fantasists from the 1960s (e.g. Alan Garner’s The Owl Service, Lloyd Alexander’s Prydain Chronicles, etc.) all the way to our times (e.g. Catherine Fisher’s Darkhenge, published in 2006, and Henry Neff’s The Tapestry series, the last volume of which was published in 2014). a) It depicts the moment of the creation of a girl out of flowers by the magicians Math and Gwydion, a scene from the Fourth Branch of the Mabinogi in the Welsh Mabinogion. This part of the story became a central inspiration for Alan Garner’s iconic (and rather haunting) The Owl Service. 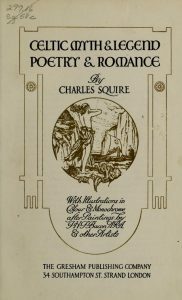 This is one of the best-known books my monograph explores, and one of the earliest. b) Blodeuwedd herself is not here a young woman, but a child, a prepubescent girl, thus serving as a nice allegory of the shaping of ‘Celtic’ myth for children/adolescents that my fantasy authors have undertaken. They haven’t quite taken flowers and turned them into a child, but they have taken medieval sources (and their later retellings) and turned them into new, original fantasy plots and characters for young readers. c) At the same time, the two magicians look rather classical/Roman, in their togas and clean-shaven faces (though I am aware I’m referring to popular perceptions here). Their portrayal points to one of the central points of my book, the fact that ‘Celtic’ myth has often been retold in such a way so as to “fit” with classical ideas of a pantheon of gods and legendary heroes that may not necessarily work with the original, medieval material. My authors have often relied on these retellings, rather than revisit the medieval sources first hand, and therefore their adaptations have an added layer of complexity in terms of attitudes and perceptions of things “Celtic”. 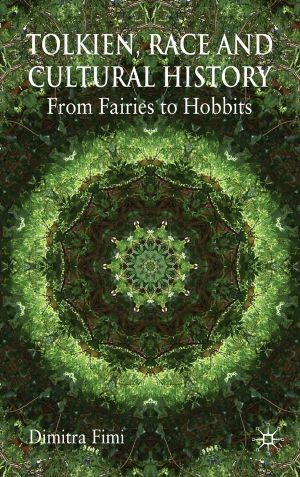 Tolkien liked drawing kaleidoscopic images and patterns, e.g. 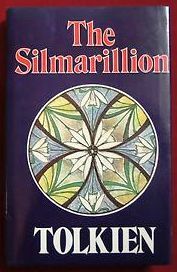 the Elvish heraldic devices, one of which was chosen for the cover of the first edition of The Silmarillion. As a child, Tolkien and his brother Hillary, used to play in Moseley Bog, a place Tolkien later claimed to be an important inspiration for the Shire. I am really grateful that Palgrave trusted me with this idea – the book still gets great comments for its cover! 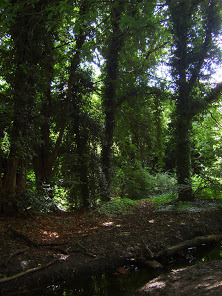 And here is my photo of Moseley Bog, taken with what I am sure now is considered a pretty basic digital camera, which served as the raw material for my kaleidoscopic manipulation! The moral of the story, I suppose – if I can call it a moral – is trust yourself as an expert on your own research. You know better than anyone what may make a good, eye-catching, but also appropriate cover. If you are given the chance to be involved in the choice of cover, take the opportunity! If no one mentions anything, still ask and show interest and willingness to engage with this process. In both cases, make sure you have given the matter some thought, so that your book ends up with a cover that at least has some significance and makes sense – at least to you!